Gone are the days of chucking on an old top and leggings or shorts, fitness and Crossfit is now mainstream and we all want to look our best in the gym. In some cases the WOD is of secondary importance to our WOOTD – workout outfit of the day! Our wardrobes and drawers are becoming packed with fitness clothing, workout and training gear. If you go to any box or competition you can’t help but notice the sock craze sweeping the community. The same goes on social media with all our friends talking about their sock game being on point or tagging their posts and pictures with #upyoursockgame. So what exactly is your ‘sock game’ and where did it come from? We all like to look good and when we look good we feel good. This is a great mindset to have, no matter what we are doing and is equally as important in the gym. A positive outlook and good vibes can help get us through the nastiest of WODs or help set a new PR. With this outlook Stance socks have been spreading like wildfire in the Crossfit community. Stance breathed life into something as mundane as a pair of socks and unwittingly created the sock game. Stance socks are made of combed cotton, polyester, spandex and nylon and are extremely soft. They have collaborated with Rihanna and are also the official sock of the NBA. Stance has fresh new take on style when compared to other sock brands and manufacturers. 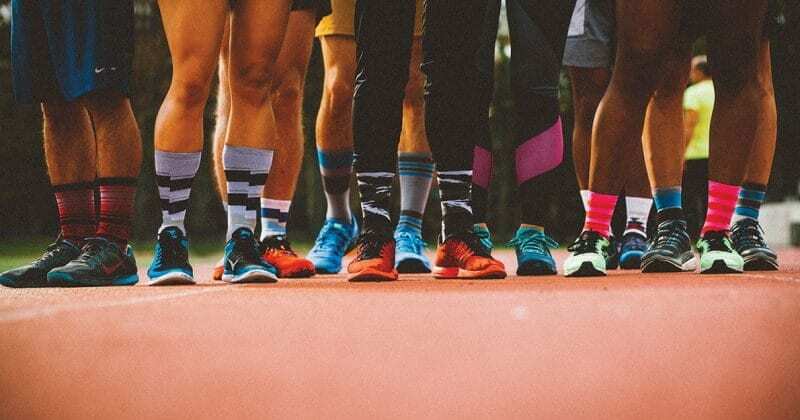 In Crossfit, many athletes wore plain black or white athletic socks, Stance has completely changed this – now colourful and patterned socks are the new thing and are taking over. Stance has ignited a movement of art and self-expression that has drawn athletes, performers and iconic cultural influencers to the brand – a group called the Punks & Poets. And by underpinning its creative roots with a relentless focus on technical innovation, Stance is now found in over 40 countries on the feet of those who dare to be different. It is rumoured that they first entered the Crossfit world in a big way when the Progenex athletes were given a few pairs to wear. In the UK and Europe the trend has almost certainly come across from the States with many Crossfitters claiming to be the first person to have worn them in their box. We are giving you a chance to win a week supply of socks. All you need to do is to post a picture of your sock game to Instagram tagging in @kitboxco and @boxrox using the #gotkit. The winner will be drawn at random on the 29.10.2015. So it looks like Stance socks are an essential part of our Crossfit kit and are here to stay – what do you think will be the next Crossfit fashion statement? Please comment below. Kitbox is a leading provider of functional fitness clothing, footwear, supplements, equipment and accessories as prescribed. Founded in July 2013, we have strayed off the beaten path from the traditional fitness world, providing our athletes with the kit they need to make them ready for the unknown. KITBox – Kit for Inside and Outside the Box.